Elbit Systems UAS Hermes 900 and innovative next-generation systems at Singapore AirShow 2012. Israeli Defence Company Elbit Systems will be featuring a wide spectrum of innovative next-generation systems at the upcoming Singapore Air Show 2012, set to take place from February 14 to 19, 2012. Visitors to the Company’s booth (#N-65, in the Israeli Pavilion), will have an excellent opportunity to view displays, live demos and media presentations of the Company’s core technologies and cutting-edge solutions answering the modern battlefield's demands for connectivity, interoperability and net-centric approaches, merging systems and platforms for enhanced speed, precision and intelligence. Elbit Systems is a leading provider of high performance turnkey UAS solutions, including advanced air vehicles, ground control stations and intelligence management centers. 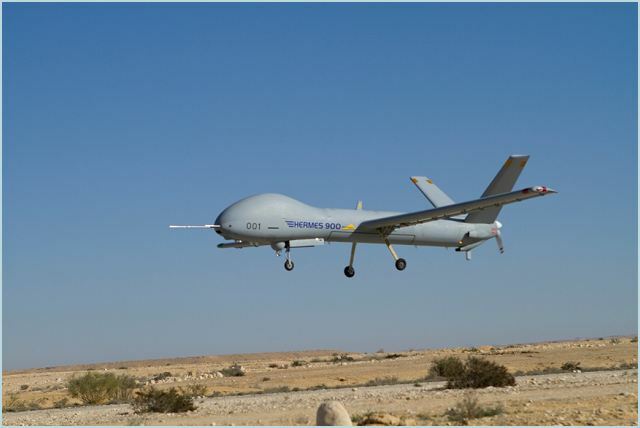 The Company's UAS have earned international recognition in the global war on terrorism and are the backbone of the Israel Defense Forces and other world leading armed forces. Skylark® I LE Mini UAS will be displayed in real-size as part of the communication set up. A range of the Company's UAS will be presented in 1:10 scale: Hermes® 450 Long Endurance Tactical UAS, Hermes® 90 Tactical Close-Range Long Endurance UAS and Skylark® II Tactical Close-Range UAS. C-MUSIC™ will make its first appearance in Singapore, presented in a 1:1 scale model. Developed by Elbit Systems Electro-Optics Elop, this unique multi-spectral Infrared Fiber-laser based DIRCM system will be showcased in an impressive 2.7m long pod hung from the booth's ceiling, demonstrating its outstanding aerodynamic structure. The pod will be outfitted with see-through windows to enable visitors to examine the advanced Fiber Laser based DIRCM mirror turret, as well as the PAWS (IR Passive Approach Warning System) sensors. Unified Self Protection Suite for Helicopters & Transport Aircraft offering advanced EW capabilities packed into a single LRU, delivering superior identification and location under challenging conditions. Elbit Systems, with its comprehensive airborne systems capabilities, can provide a single sensor or an entire cockpit avionic suite. GATR – Guided Advanced Tactical Rocket is installed on 68/70 mm rockets to convert them into metric precision guided weapons, for air-to-ground or ground-to-ground missions. Elbit Systems’ C4I software solutions for the infantry, together with the decades of communications experience of Tadiran Communications, offers extensive, battle-proven expertise for the most intense combat scenarios. • Tadiran SDR-7200 HH is a hand-held, lightweight software-defined radio for the dismounted soldier. • Tadiran PNR-1000A is a Personal Network Radio providing on-the-move situational awareness. • MIPR (Military IP Radio) is a tactical IP radio delivering high-speed broadband data communications to the battlefield. • Tadiran CNR-9000 HDR is a multi-adaptive, VHF/FM radio system for tactical voice and high-speed data communication. • Tadiran HF-8000 is a multi-adaptive HF radio system for continuous long-range communication. • Tadiran VIC-500 is an advanced, reliable and customizable digital intercommunication system for fighting vehicles. • CNR-710MB is a multi-band hand-held radio for multi-mission communications. • MRS is an advanced, multi-sensor-compatible C4ISR system for real-time situation awareness, accessible to all echelons. • G-Force is a ground-based protection shield aimed for the protection of defined areas such as airports, sensitive installations etc. • Data Links for manned and unmanned aircraft, guided weapons and space platforms, as well as unique SAR (Search and Rescue) systems for combat and non-combat applications. • Tactical Video Data Link (TVDL) transceiver system enabling attack helicopters to download broadcast quality live-video imagery and telemetry data from UAS, and to relay the information between helicopters on operational missions, as well as to ground forces. Dominator® IICS (Integrated Infantry Combat System) is an integrated infantry combat system that enables full situational awareness from the infantry battalion level down to the individual soldier. Dominator® dramatically shortens the sensor-to-shooter loop, enhancing the combat effectiveness of the dismounted soldier.